Diamond is the hardest natural material known on Earth. Yet diamond is just pure carbon. What is special about this element that makes diamond so hard? In a perfect diamond crystal, each C atom makes four connections—bonds—to four other C atoms in a three-dimensional matrix. Four is the greatest number of bonds that is commonly made by atoms, so C atoms maximize their interactions with other atoms. This three-dimensional array of connections extends throughout the diamond crystal, making it essentially one large molecule. Breaking a diamond means breaking every bond at once. Also, the bonds are moderately strong. There are stronger interactions known, but the carbon-carbon connection is fairly strong itself. Not only does a person have to break many connections at once, but also the bonds are strong connections from the start. There are other substances that have bonding arrangements similar to those of the diamond. 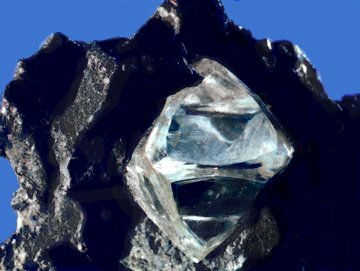 Silicon dioxide and boron nitride have some similarities, but neither of them comes close to the ultimate hardness of diamond. Diamond is the hardest known natural substance and is composed solely of the element carbon. Introduction to Chemical Bonds by Jessie A. Key is licensed under a Creative Commons Attribution-NonCommercial-ShareAlike 4.0 International License, except where otherwise noted.